Inspiration is a funny thing. The Rainbow Pocket Market Bag was brewed up in my brain as a crazy combination of Earth Day, the Beatles’ Yellow Submarine, my constant struggle with getting organized, and the desire for a little color in a cloudy rainy week! And the result is a free crochet market bag pattern that’s useful all year long! 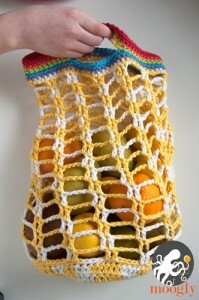 To make this fun reusable bag I used a couple of specific crochet techniques, and I’ve included links to them in the bullet points of the pattern. I also borrowed the mesh pattern from the Artfully Simple Infinity Scarf – though worked in rounds, not spirals. I’ve also learned from all of you that both short and long handles are popular – and included directions for two different types of handles! 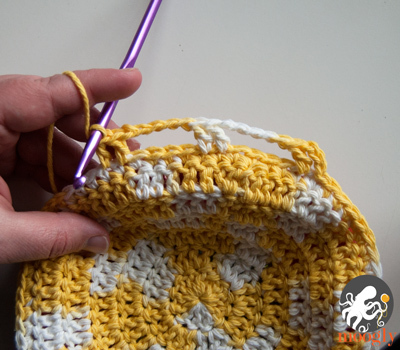 So let’s get to that crochet pattern! Sateenkaarilaukku.pdf – (Finnish) courtesy of Laura Rankonen – thank you Laura! Place the two circles Right Side together, with the Color A circle on the bottom, as shown below. 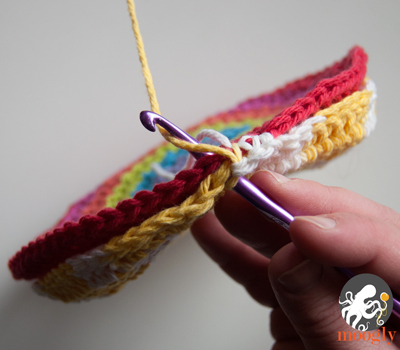 Insert hook through a st of both circles, and using Color A yarn, sc through both layers for 56 sts. Round 1: Ch 3, and dc in the next st. Ch 5, skip 4 sts. *Dc in the next 2 sts. Ch 5, skip 4 sts. Repeat from * to end. Join with a sl st to the top of the first dc (skipping the ch 3). Round 2 – 15: Ch 3, dc in the next ch sp. Ch 5, skip the rest of the ch sp and the next dc. *Dc in the next dc, dc in the next ch sp. Ch 5, skip the rest of the ch sp and the next dc. Repeat from * to end. Join with a sl st to the top of the first dc (skipping the ch 3). Round 19: With Color D, join to any st of Round 18 and sc in the first 12 sts. For Short Handles, ch 14; for Long Handles, ch 50 (or longer if desired). Skip the next 12 sts, sc in the next 24 sts, ch same amount for second handle (14 or 50), skip the next 12 sts, sc in the last 12 sts. Break yarn and Seamless join to the 2nd sc of the round. Weave in ends. 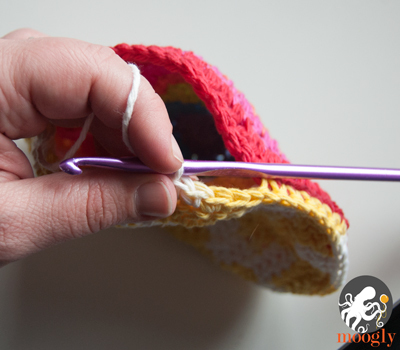 Use the F hook and any color of yarn. Round 1: Starting with a Magic circle, work 6 sc into the circle. Join with a sl st. Round 2: Ch 1, and work 2 sc in each st around. 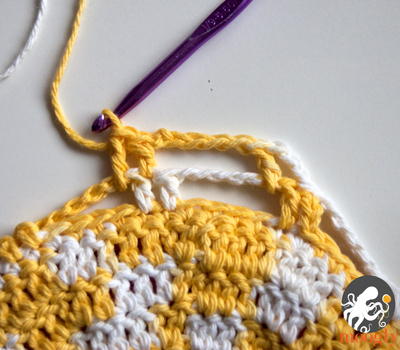 (12 sc) Break yarn and use Seamless join to finish off. Embellish with Surface Crochet or embroidery sts if desired. Sew to multicolored circle at opening, as shown. With Color A, ch 15 or long enough to get loop around the button of your choice. Sew both ends to the Color A circle opposite the button, as shown. Now you can take a little rainbow everywhere – and never be without a bag when you need one! Reusable bags are definitely the way to go, and I never head to the store without them! 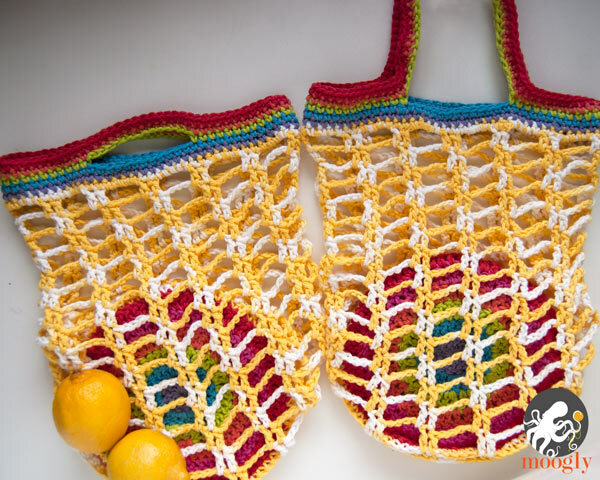 I hope you’ve enjoyed the pattern for the Rainbow Pocket Market Bag – I look forward to seeing your photos on Facebook and Ravelry! Written pattern copyright Tamara Kelly 2013. Please do not reprint or repost this pattern, but please do link to this page to share this pattern with others. If you wish to make baskets for sale from this pattern, please visit the About page for details. 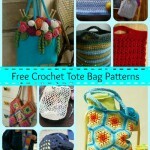 Carry It All with 10 Free Crochet Tote Bag Patterns! That is just adorable! And very handy. Thank you for sharing the pattern! Could this be any cute! Could this be any cuter! Queued and ready to start! Fabulous, thank you for sharing! I love it! The colors are awesome and I’m a big fan of things that fold up small, great for traveling. I love this bag! This would make a great beach bag as well. You could put a pair of sandals, a towel, sunglasses, and sunscreen inside and it would fit perfect. Thanks for sharing. Great idea Susan! Glad you like it! Is there a PDF? That you could post? Kelsey, try the Print Friendly button all the way at the bottom of the pattern! Congratulations on the new grand daughter! And that IS exciting! 😀 Thanks so much for telling me about it! At first: sorry for my Bad english! I love this, but something went wrong with my first try. It’s hard to understand what kind of yarn you used for german people… Can you explain me? In Germany we don’t have the name “worsted weight”. My bag was really small and it seams like the mesh Side was to small for the bottom… Will try it again! Thank you for sharing this beautifull Pattern! Will Be a great gift! The kind of yarn I used is what is also known here as kitchen cotton. Most worsted weight yarns are 10 ply. I hope this helps! I love this idea, my bag is always folded up in my purse, but this is tres cool. 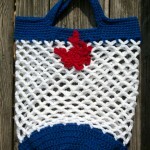 You could add a short strap and have it be a fashion accent or statement on your handbag or in my case tote bag. And anything that combines Earth Day and Yellow Submarine…well is something for me. Can’t wait to try this, thanks for sharing. You’re very welcome! Great idea on the strap! Is there any chance for an instructional video for this bag? It would help me greatly to see the process. Oh, I so love this, Tamara! Wish I could make one these days! Thank you so much for your patterns! I love every one that I have tried. This one has got to be one of my favorites, and I can’t wait for Saturday Market to start up again next month! I just started with this pattern 3 days ago, and I just started my third one! Wow! Thank you so much Tina! 😀 I’m so glad you enjoy it! It’s probably just me, but I can’t see how it works with the button. Is it just for looks or is it required to be on the bag? I don’t see how a button works on the button of this bag. The button is just to close the pouch when it’s all folded up. It’s certainly optional if you want to leave it off! I’m just a bit confused about the mesh part chains 2-15. As I get to the end of one round am I making 2 DC’s then skipping the chain three and then chaining another 3 to begin another round? At the end of the round, you make the 2 dc sts, ch 5, and join to the first dc, skipping over the ch 3 that started the round. Then to start the next round you ch 3 again. Does that help? 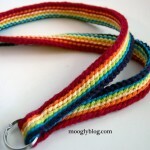 Please stop making fabulous stuff to add to my “to crochet” list!!! Love love love this pattern! Just finished my first one and I’m out to buy more cotton in colors to have one for everyday of the week and to give to family. 😀 So glad to hear it Jessica! I love this pattern and have the bottom two circles made. Now I am wondering: is the purpose of the buttoned bottom to put the entire bag in for storage? I don’t see how this works,. Do you turn the bag inside out? I was also wondering why you put the two circles Right side together. Hi Joan! Yes, the circles will turn right side out and “pull” the bag into the space between them, for storage. The circles are right side together so that when the bag is in the pouch they are the ones that show. Thank you so much for this lovely pattern. My mother in law made me one like this in the 70’s and someone stole it from me! I have been looking for a similar one and always going to work one up but other projects came first. I rarely knit or crochet for myself. Again many thanks and keep up the great work. 😀 Thank you so much Madelaine! Thank you so much for this! All my friends are getting these for birthday presents this year! It’s perfect! You are a freaking genius!!! I’m going to make a bunch of these. Thanks so much for the free pattern. 😀 Thank you so much Cindy! I needed a quick birthday present and this did the trick. Such a clever design! Thanks for sharing. 😀 Thank you Grace, I’m glad you liked it! Oh no! I was having a great time, and now I’m stuck. On round 16 instead of 72 stitches I have 61. I began with 12 ch 5 spaces at the bottom. I’m really lost. Can you help? 😀 So glad to hear it! Thank you Liz! I love this bag so much. I’m planning to make one that look like a watermelon! 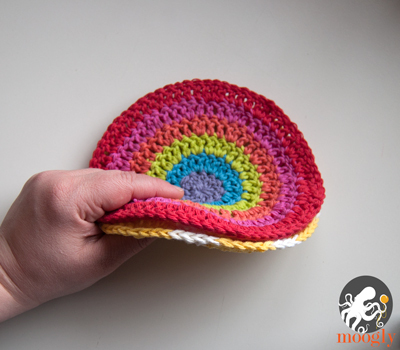 I just had one question: For double crochet circles I’ve used patterns that count the chain 3 at the beginning of each round as the first DC. In this pattern for the solid color circle does the chain 2 at the beginning of each round just get hidden between the first and last DC of each round ? I hope that makes sense. I made one and then was asked by my mother and a friend to make one for them as well.